La bujía se ajusta en Barkas B1000, Trabant, Wartburg, Simson S51, S50, S60, S70, SR50, SR80, KR51/1 & KR51 / 2 golondrinas, S53, S83, SD50 y toda la serie, gorrión SR4-1, SR4-2 estrella, SR4-3 Gavilán, Halcón SR4-4 así como SR1 y SR2, MZ TS 125 150 250 y ETZ 125 150 250 251 301 de aves ALLÍ, ETS. BOSCH SHORT CODE: WR78. FITS MAKE: WARTBURG. FITS MODEL: Wartburg. BOSCH SPARK PLUGS > SUPER-4. SPARK PLUG TYPE: BOSCH SUPER 4 SPARK PLUG. 100% SECURE. Whybee Ltd. We want you to be totally satisfied with your order, so if for any reason it’s not suitable we are here to help. Spark Plug & HD conduce Probador Indicador herramienta para la prueba de Bobina Wartburg. 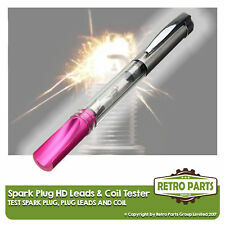 $This non-contact spark tester will test for the presence of power on spark plugs, coils and distributors. Simply place the grooved end over the spark plug wire with the engine running and the high intensity bulb will flash indicating spark. Pen type pocket clip for handy use. CE certificated and ROHS compliant. 12cm long Wartburg. Material: Yttrium Enhanced Copper Core. Make: WARTBURG. Model: 353 W. BOSCH SPARK PLUGS > SUPER PLUS. Bosch Short Code: 10. Plug Type: Super Plus. Part Type: Spark Plug. Warranty Period: Manufacturer Warranty if applicable - See Bosch website for more details. $ Este probador de chispa sin contacto a prueba de la presencia de encender enchufes de chispa, bobinas y distribuidores. Simplemente coloque el extremo ranurado sobre el cable de la bujía con el motor en marcha y la bombilla de alta intensidad parpadeará indicando chispa. Pluma tipo bolsillo clip para uso práctico. Certificado CE y ROHS obediente. 12cm largo Wartburg. Enchufe de chispa de 1pc BOSCH 0241345512 WARTBURG. MPN 0241345512. WARTBURG 353 1.0 37 < abarcan clase = notranslate ' >-04.1969 < abarcan clase = notranslate ' > 02.1975. WARTBURG 353 romper < abarcan clase = notranslate ' > 1.0 37 < abarcan clase = notranslate ' >-04.1969 < abarcan clase = notranslate ' > 02.1975. Specifico per: WARTBURG AWE 1 3 1.3 43 kW MOTORE VolksWagen 09/88-05/91. 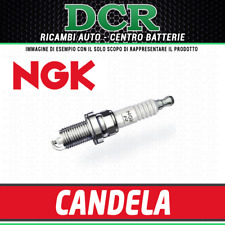 Le candele d’accensione a marchio NGK sono sinonimo di qualità, affidabilità e durata nel tempo. L'INSERZIONE SI RIFERISCE ALL'ACQUISTIO DI UNA (1) CANDELA. WARTBURG 353 1.0 Spark Plugs Set 4x 71 to 75 2941527RMP NGK. WARTBURG 353 Tourist 1.0 Estate Petrol 04/1969 02/1975 FWD 0 50 37. Spark Plug Unscrewable SAE connector, Iridium Middle Electrode, 1 - Earthed Electrode, interference Suppression 5 kOhm, with gasket seat. ZASTAVA 101 (1100) 1.1 Hatchback Petrol 05/1975 12/1993 FWD 8 56 41. BMW 2500-3.3 (E3) 3.0 Si Saloon Petrol 07/1971 09/1975 RWD 12 200 147. Electrode Gap [mm]: 0,7. BMW 2500-3.3 (E3) 3.0 S Saloon Petrol 05/1971 04/1977 RWD 12 180 132. WARTBURG 353 1.0 Spark Plugs Set 4x 69 to 75 Bosch. WARTBURG 353 1.0 Saloon Mixture 04/1969 02/1975 FWD 3 50 37. WARTBURG 353 Tourist 1.0 Estate Mixture 04/1969 02/1975 FWD 3 50 37. Thread Pitch 1.5 mm. WARTBURG 353 1.0 Spark Plugs Set 4x 69 to 75 18mmKerze NGK. WARTBURG 353 1.0 Saloon Petrol 04/1969 02/1975 FWD 0 50 37. Spark Plug Unscrewable SAE connector, Nickel Middle Electrode, 1 - Earthed Electrode, no interference suppression, with gasket seat. VOLVO P 544 1.8 Hatchback Petrol 08/1961 07/1967 RWD 8 80 59. Engine Code: C30NE,30E,S30E, Electrode Gap [mm]: 0,7. OPEL MONZA A (22_) 3.0 GSE Coupe Petrol 09/1985 08/1986 RWD 12 156 115. OPEL MONZA A (22_) 3.0 GSE Coupe Petrol 02/1978 08/1986 RWD 12 180 132. WARTBURG 353 1.0 Spark Plugs Set 4x 71 to 75 3657022RMP NGK. WARTBURG 353 Tourist 1.0 Estate Petrol 04/1969 02/1975 FWD 0 50 37. Spark Plug Unscrewable SAE connector, Nickel Middle Electrode, 1 - Earthed Electrode, no interference suppression, with gasket seat. VAUXHALL SENATOR Mk II (B) (V88) 3.0 Saloon Petrol 09/1987 08/1988 RWD 12 183 135. OPEL MONZA A (22_) 3.0 GSE Coupe Petrol 02/1978 08/1986 RWD 12 180 132. OPEL MONZA A (22_) 3.0 GSE Coupe Petrol 09/1985 08/1986 RWD 12 156 115. Electrode Gap [mm]: 0,6. VOLVO 140 (142, 144) 2.0 S Saloon Petrol 11/1968 09/1972 RWD 8 101 74. VOLVO 140 (142, 144) 2.0 S Saloon Petrol 09/1972 08/1975 RWD 8 116 85. Electrode Gap [mm]: 0,8. VOLVO 140 (142, 144) 2.0 Saloon Petrol 08/1968 07/1974 RWD 8 82 60. 1x Campeón Copper Plus L82C Bujía Reemplaza L7 y L10S. Manufacturer Part Number L82C. Part_Number L82C. Desde hace más de 100 años, Champion ha sido un líder mundial en la fabricación de bujías de encendido para cada tipo de motor de combustión. Replaces W12A W7AC W9A B5HS BR5HS. Manufacturer Part Number L86C. part_number L86C. Bujías Champion. Bujías Champion liderando la industria con beneficios de desempeño innovador. Manufacturer Champion. Part_NumberZ68 / 0001430701. BERU Ultra Spark Plugs. The Green Spark Plug. Ignition > Spark Plugs. Spark Plug1 - Earthed Electrode. Cross Reference8500,0 241 229 565,0 241 229 604,0 241 229 612,0 241 229 857,0 241 229 887,0 241 229 918,0 241 229 923,N 22,W 145 M 1. 1 x NGK núcleo de cobre bujía BP6HS (4511). Bujías NGK BP6HS. Manufacturer Part Number BP6HS. Part_Number BP6HS. Manufacturer NGK. La bujía de encendido verde. Ancho de llave hexagonal20.8 mm (13/16"). Enchufe de chispa WR7BC 0242235665. para la mayoría "Viejo" Opel el CIH de 4 cilindros - clase y para todos CIH - motores de Opel Ascona / Manta A y B, Cadete B y C, ficha D y E, GT, etc. 4 x cable de la bujía Bosch Opel CIH Manta Ascona Kadett GT WR7BC 20E 20 2.0 l.
Campeón L82C / L82C/T10 cobre PLUS sustituye a enchufe de chispa 031 150. Champion L82C / L82C/T10 COPPER PLUS Spark Plug Replaces 031 150. MPN L82C / L82C/T10. Manufacturer Part Number L82C / L82C/T10.